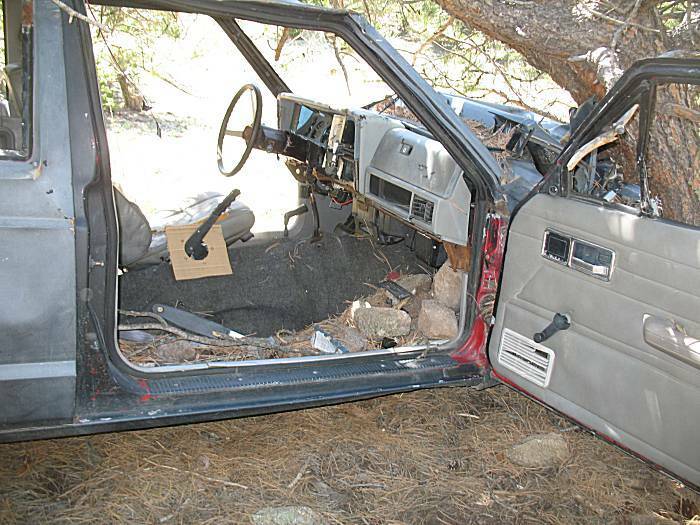 This trail run had one intent - to look at the abandoned vehicle, with the desire to relocate it to a public roadway accessible to the Sheriff for processing, along with viewing the trails to see which route would be easiest for removal. That was the intent and, to a great extent, it was accomplished. 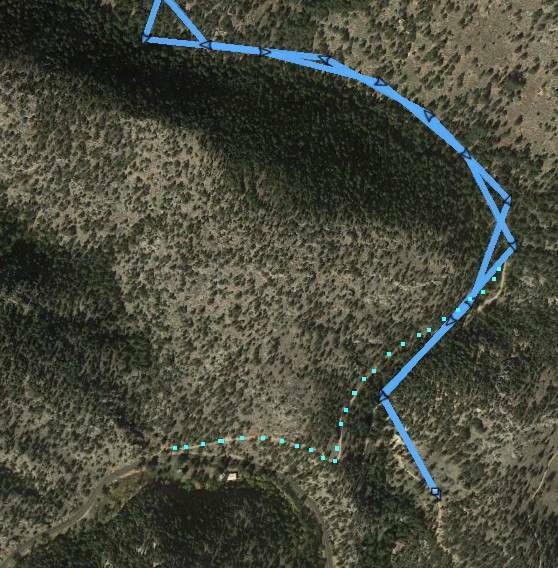 Only a short bit of trail (the blue dots in the bottom left of the below map) was not traveled as it was blocked off. 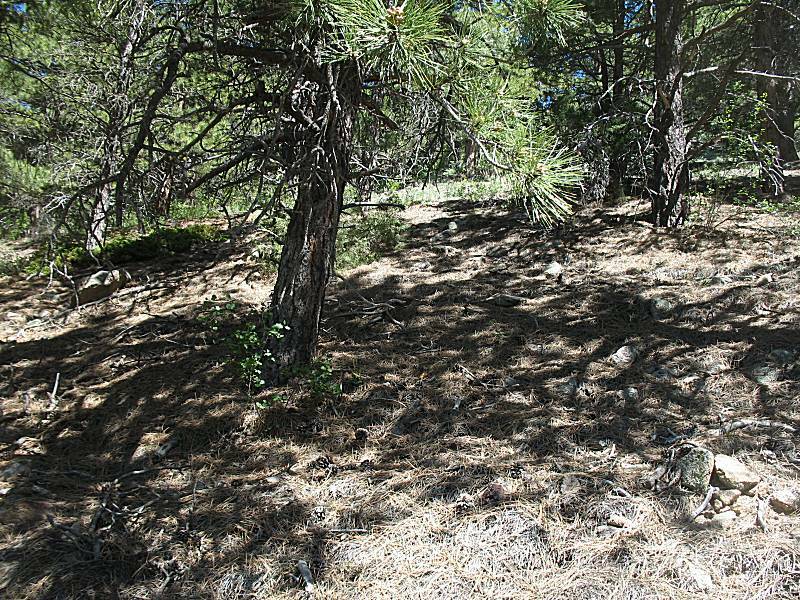 Permission from a landowner is likely needed - for viewing and removal. All of them tie down to one issue: I did not have my security lug nut key with me. A week or so ago I replaced the left front brake line and removed the wheel for the task. When the job was complete, I could not find the lug nut key - perhaps it was on the lug nut when I took a ride around the block. I looked around the block but came up empty - no key available. Now I needed to order a replacement (the paperwork was filled out, sealed, and on the desk awaiting deposit into a mailbox - almost called "The Check's In The Mail") before a flat tire would happen. While the issue would be on my mind (not being able to change a flat tire), when was the last time I _had_ flat tire? What are the odds I'd have one today, or any time this summer??? 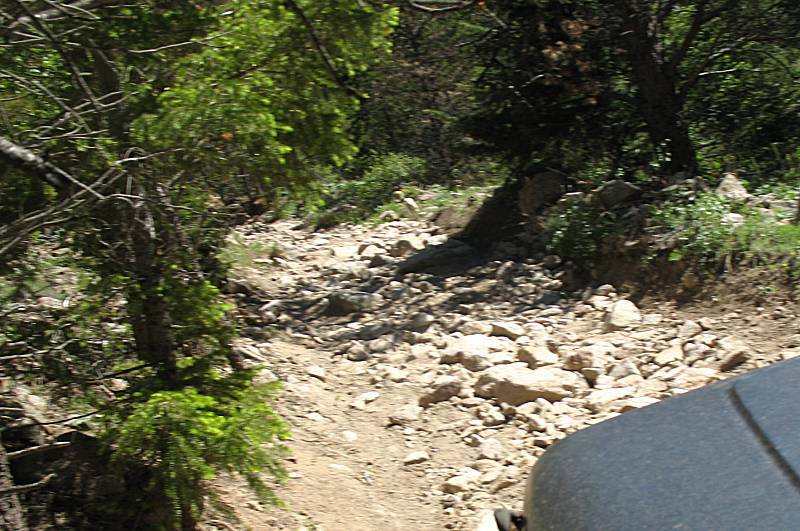 The fundamental of the Front Range 4x4 group is to always go out with at least one other member Just-In-Case "The Crud Hits the Fan" - help would be at hand. 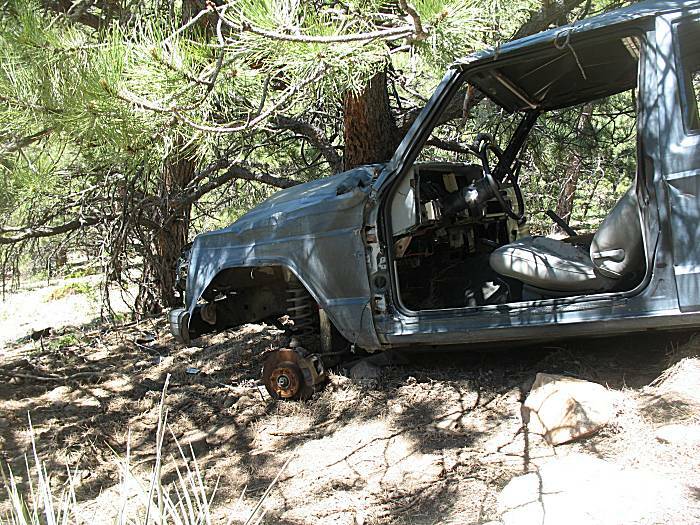 With help at hand the Jeep would likely never be left alone on a trail - it would be hauled out for easy repair or towing. So, without the group, they could come in as a good thing to have, but with the group, they would be not needed. Today, having them and the group - but not key - would be the Catch-22. Don't Leave Home Without It is the base of issues today. On this trail run, only one member, Tom, said "Yes" to joining in. Early in the day he made one comment that would "Come Back To Me"... 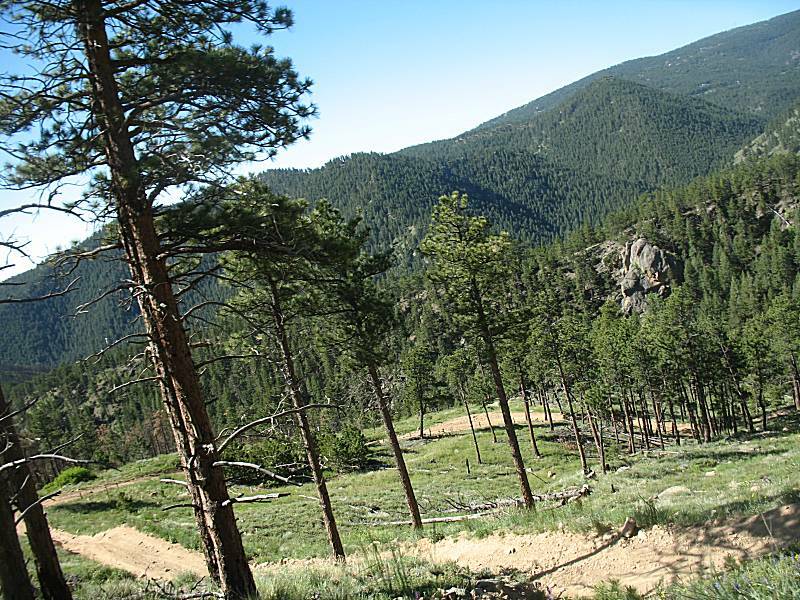 This should be an easy trail run as I'm looking to get home and enjoy an relaxing afternoon. All of that stacked up, off we went. We discussed going up Big Momma Hill and/or Fireman Hill but neither of us was overly interested. Big Momma we skipped out on but at the Fireman turn we made a decision to ride up. There's a nice overlook at the top and from a prior visit to the trail it's about the same amount of time to the next intersection as the "normal" trail (it wouldn't slow us down). Down from Fireman and coming to the "Upper Kiosk" intersection we headed to the abandoned vehicle area. 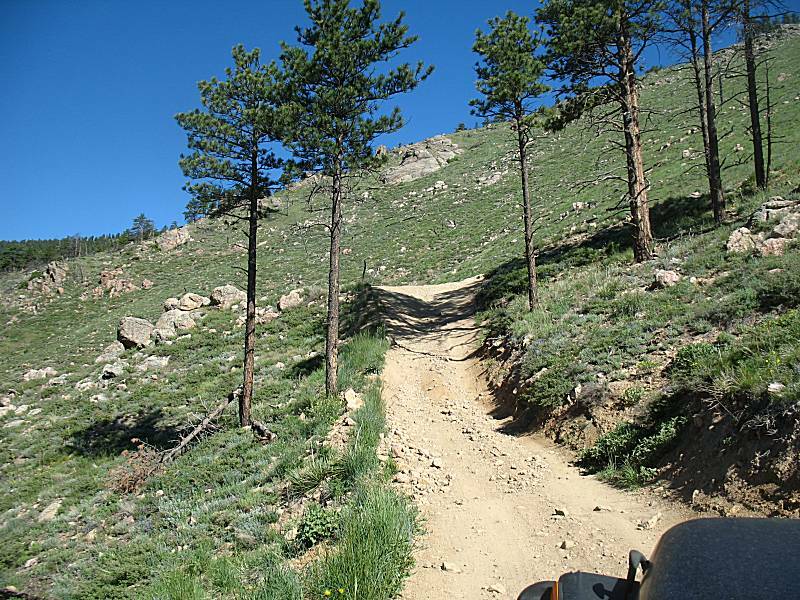 While much of the trail is "typical" there is perhaps a 500-1000 foot section that is decently rocky, slow, and on a slope. 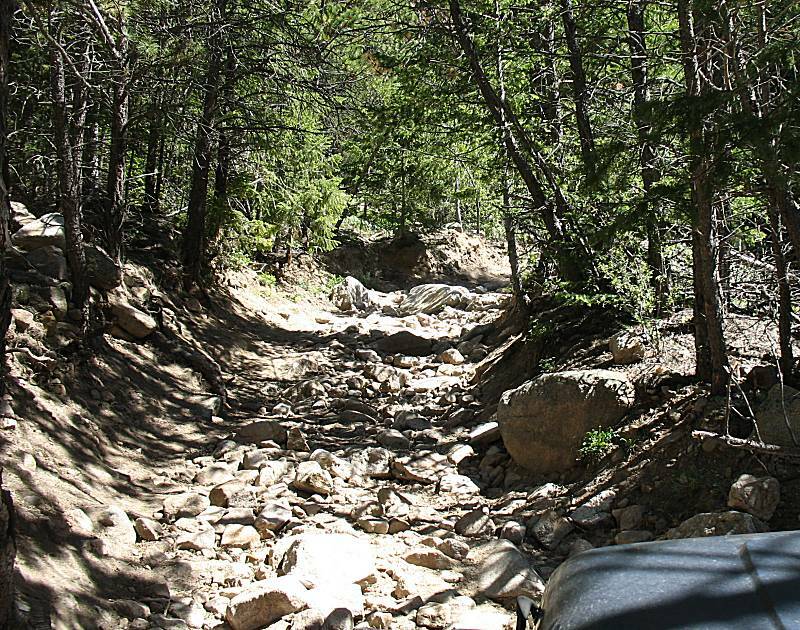 It is the one section of trail that I would not wish to haul a dead vehicle up. Near the end of this section is the vehicle. 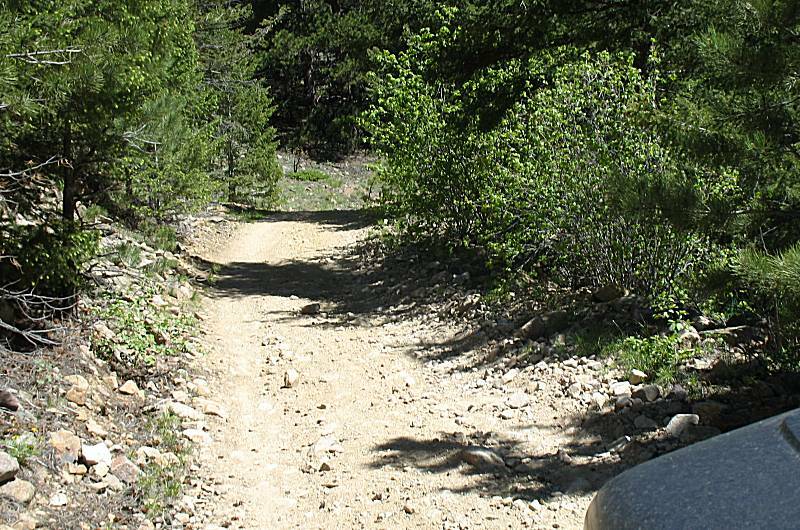 We passed the vehicle to check out the dead-end trail that ends at private property. 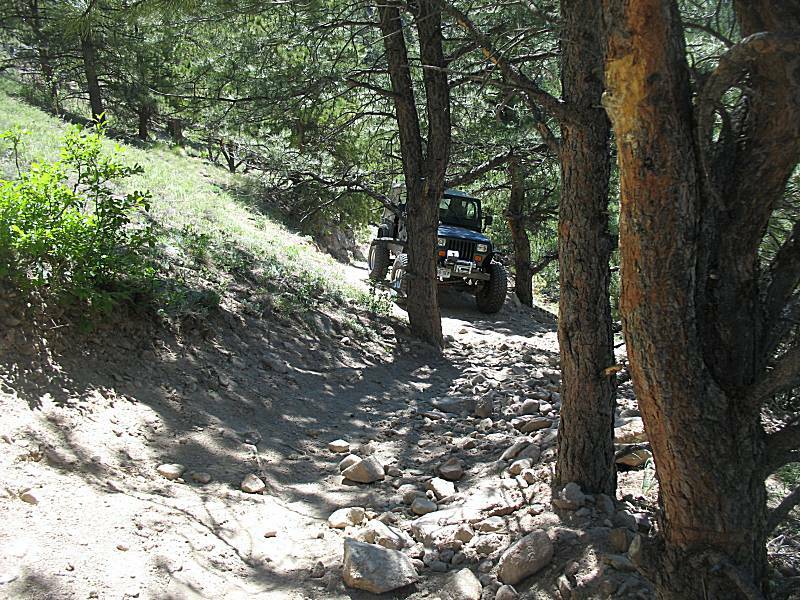 The goal is to see if the remaining trail is more difficult or less difficult than the slow, rocky, uphill. 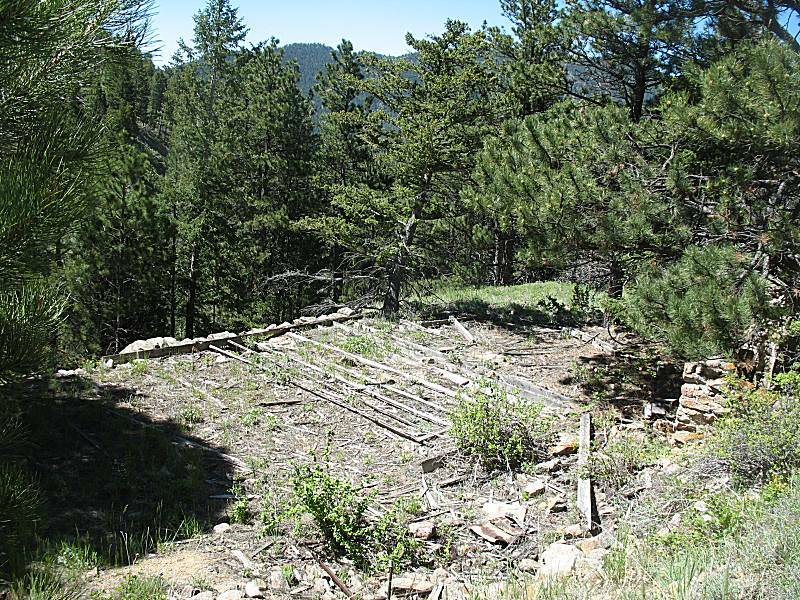 If the dead-end is easier, I'd check with the property owner for permission to open the gate for the removal project. If it were harder, no need to check with the property owner. In all, for what we could tracvel of the dead-end trail, there was one section of 500' of downhill boulders and the rest was easy. The dead end route, so far, looked preferred. With that known, we headed back to the vehicle for inspection and photos. 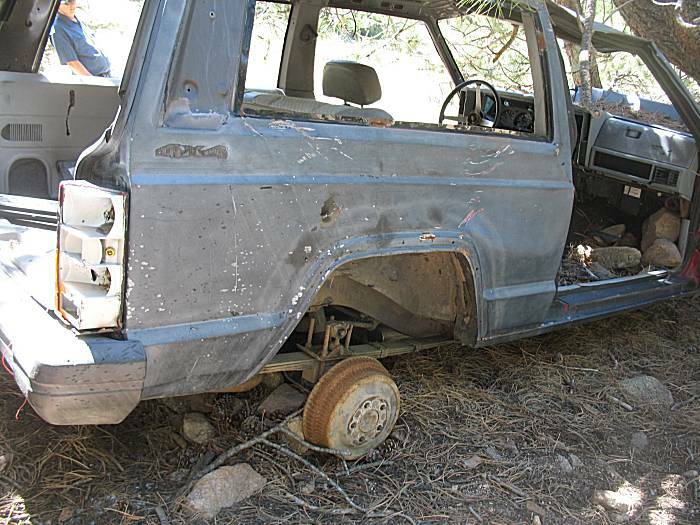 With a set of wheels and tires, it looks like the project could be tended reasonably easy (to get the vehicle to a nearby trail). 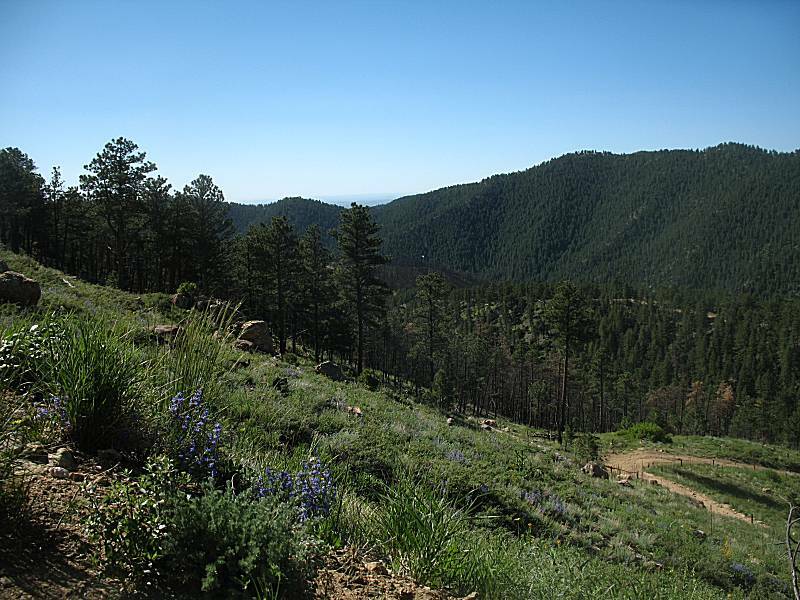 Tom walked back to his Jeep, sitting at a nearby intersection and I back to mine, on the up-slope trail. 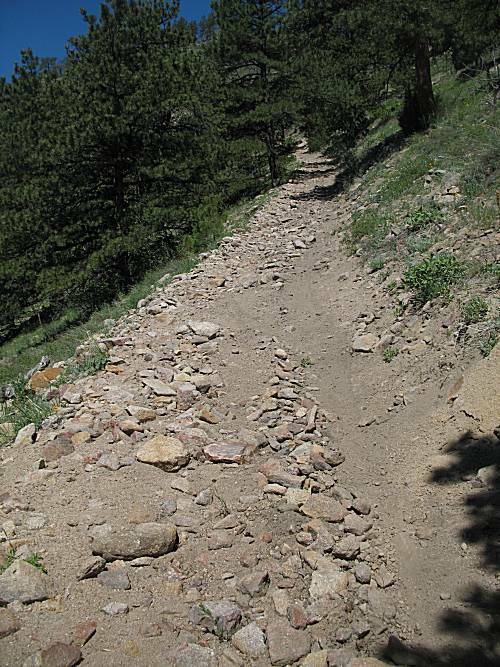 The trail I was on was a short dead-ender that was somewhat narrow. 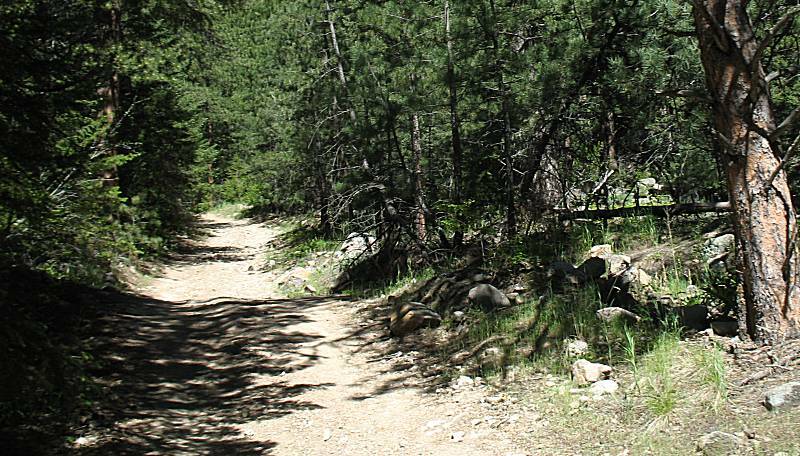 Not desiring to back down this narrow trail and often wanting to see what's over the next hill or around the next corner I continued forward. 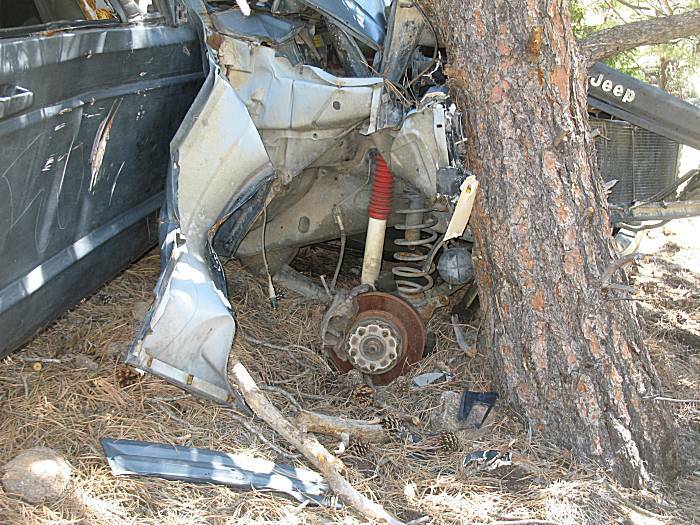 Perhaps 50' from the dead-end / turnaround, a short tree-stump sliced the sidewall of the right rear tire. 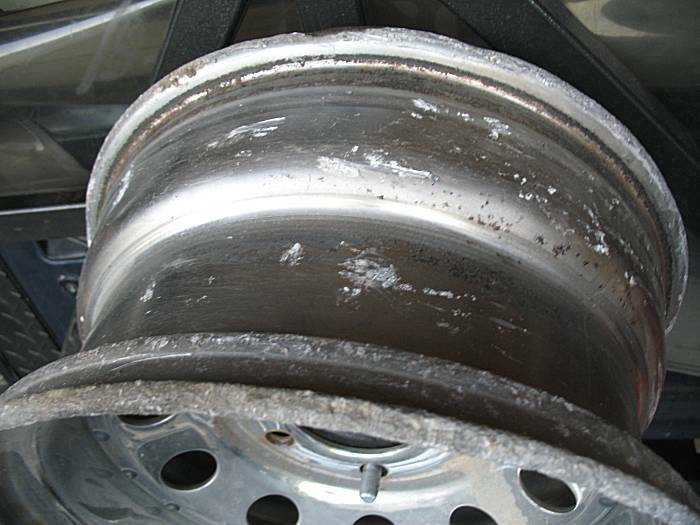 Sliced sidewall = no repair for the tire - it's junk. Sliced sidewall also means no air NOW - full flat NOW - not a slow leak that can be limped along. RATS. I left home without it (the lug nut security key) thinking what are the odds. On my mind was a mental "Sorry Tom" as this would throw a monkey wrench into the best laid plans of mice and men. He likely would not be getting home, early, for a relaxing afternoon. I called back on the radio to him that I had a flat and would take a minute to look at the situation. 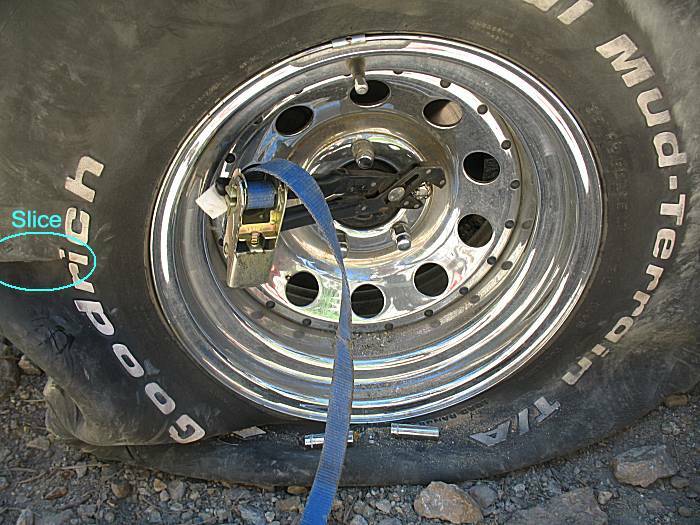 Out come the pliers - clamp down on the lug nut - not budging. The pliers would slip before any movement. 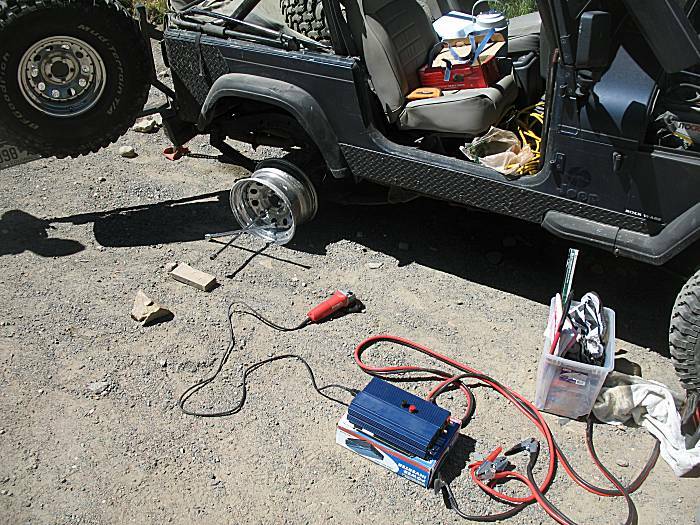 Pull out the jumper cables - ends to the battery and negative to the wheel while positive arc-pits to the security lug nut. The goal was to Rough It Up so that the wrench could Get A Grip. No Dice. Then, I Read Somewhere, you could smash a socket into the end of the lug nut security ring - Let's give it a go. Scan the various sockets and pick a few that were about the right size. Find a suitable rock and give it a whack. Solid metal vs. solid metal - no yielding noticed. Hmmm... What if we soften one of the metals? Clamp a socket into the end of the positive jumper cable and touch-arc the socket to the end of the security key. The socket soon glowed orange hot. 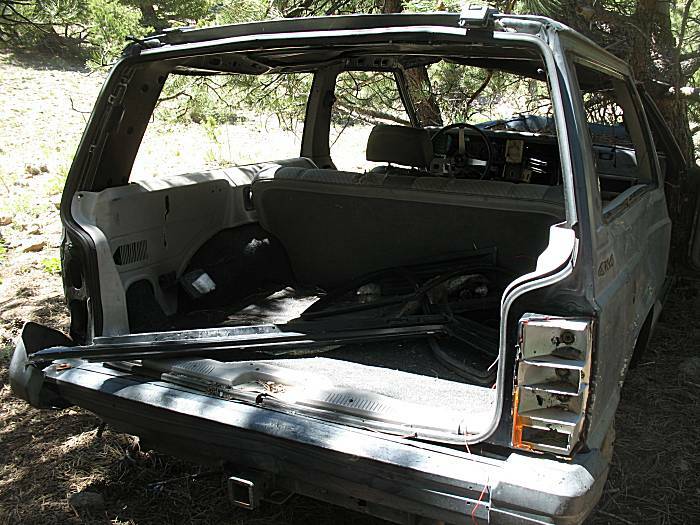 Quickly change from jumper cable to pliers and whack with the rock - No Dice. 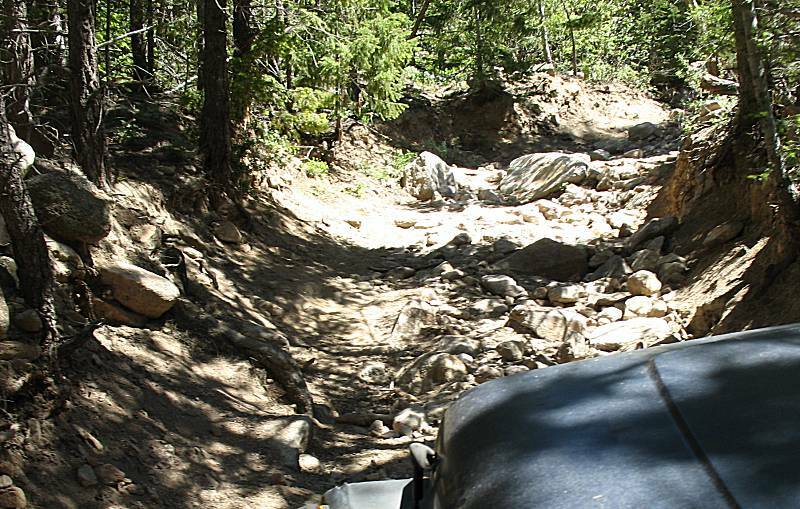 Ugh, With Plan A Dead In The Water, it's time to move to Plan B: Drive it out to the trailhead. Pack up the tools and work to turn around. About 30' into the trail I'm met with a right turn with a reasonable amount of strong "catch trees" on the down side of the trail. 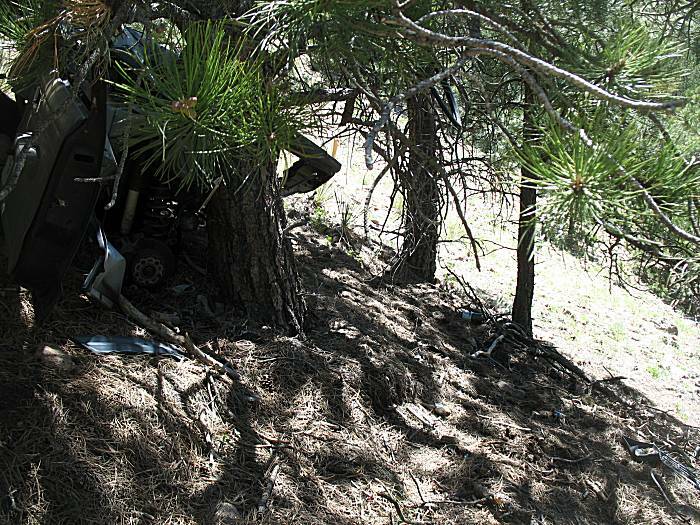 Catch trees, as I call them, would catch any vehicle from rolling down the hillside. Often, they're a good thing to have - today, when it rains it pours. 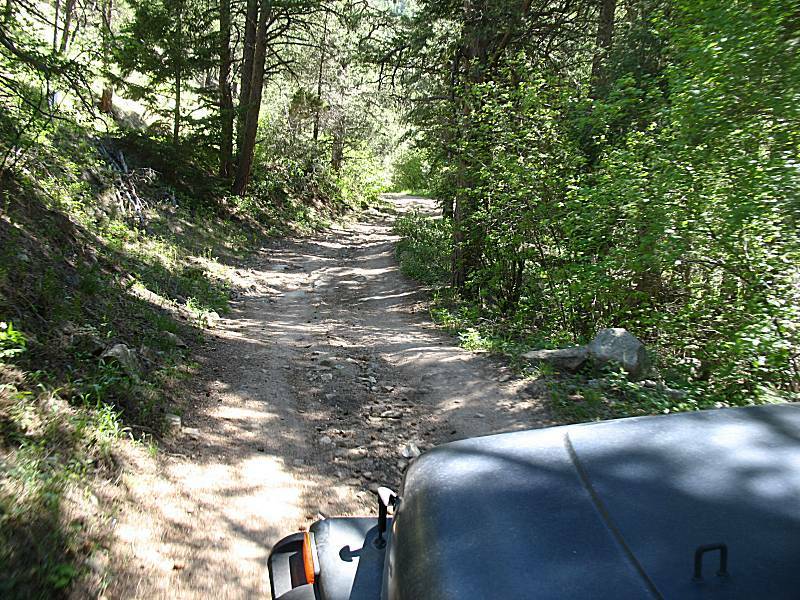 When I came to the downslope slanted right curve, the jeep, with a flat tire in the right rear, wanted to move to the downslope right - and it did - and into the trees. 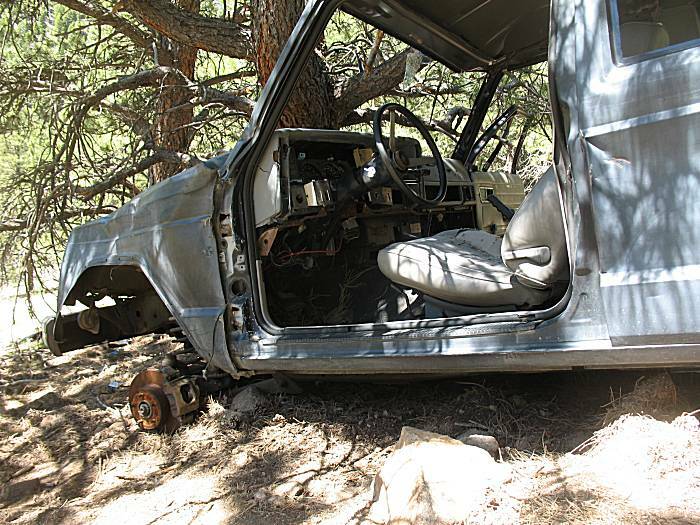 They did their job and I was not worried of rolling down the hillside, but they did a wonderful job of ripping to pieces the soft top and bending the soft top frame. Somewhat like the one tire that was sliced, the soft top is On The List for replacement. I've patched it several times so I'm not overly frustrated. 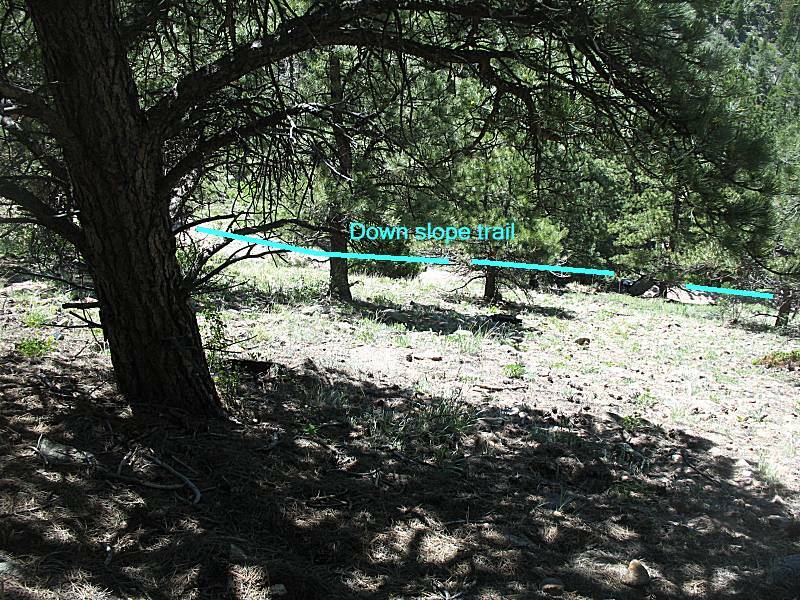 Through the corner, my goal was to "stay left" which is the safer "uphill" side of the trail. I rode half off the seat, hanging out, just in case (not overly needed, but it's easy to do so why not). Approaching the sidewall slicing tree stump on the now good left side tires I paid attention to not have two or three flat tires. Dead end-trail processed Tom and I now have to drive out - but not before heading up 500-1000 feet of bouldery trail. 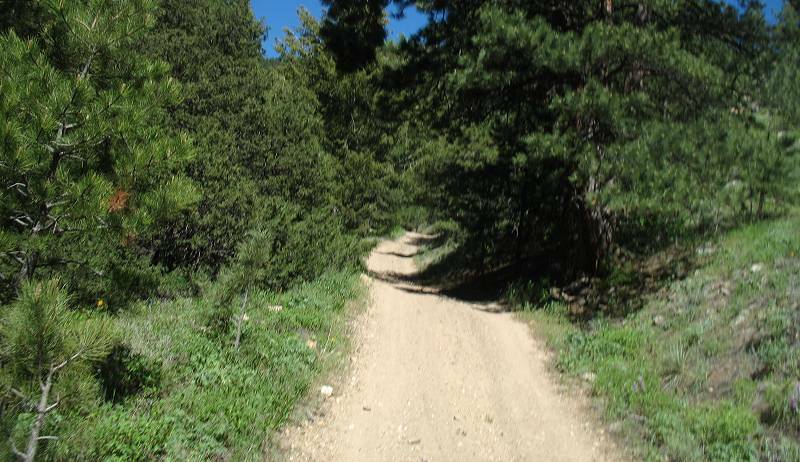 One item of note - the flat tire offered EXCELLENT traction on the difficult uphill. Plodding along at 1/2 to 2MPH we went. 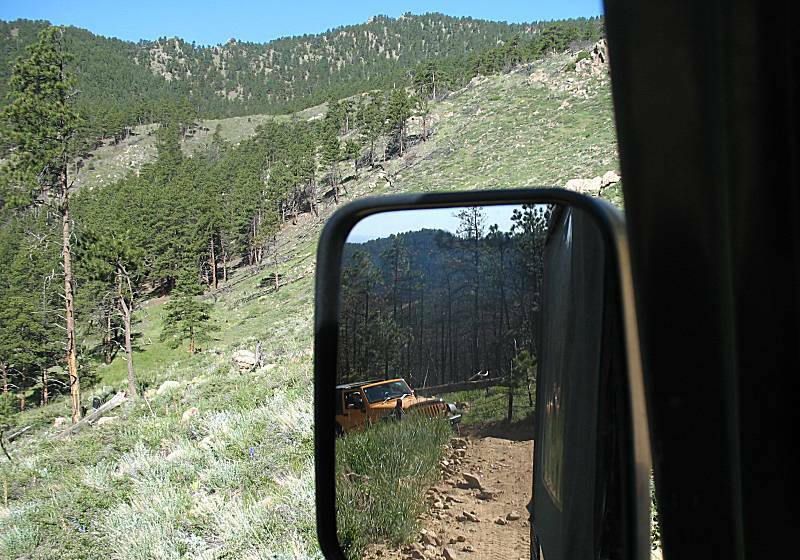 At the intersections, with others sitting around, they had curious looks and humorous smiles to the jeep with a flat and one good spare on the tailgate. 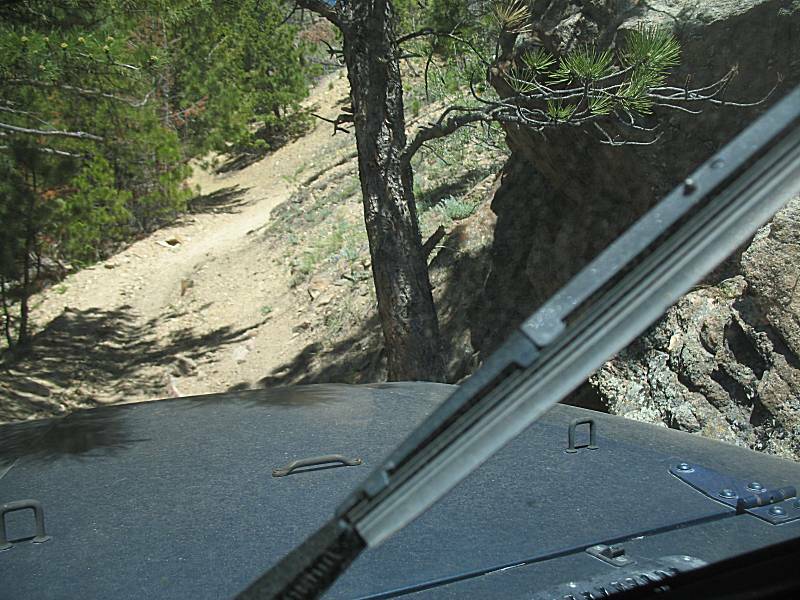 We made it to about 1/2 mile from the trailhead where we met an uphill set of jeeps. Uphill traffic has right-of-way. I had a spot I could pull into but I'd have to make a 90-degree turn into it. Turn done and traffic let by (Tom backed up to the next intersection, a bit of a drive), I turned back to the trail - with only three tires. The flat tire de-rimmed. 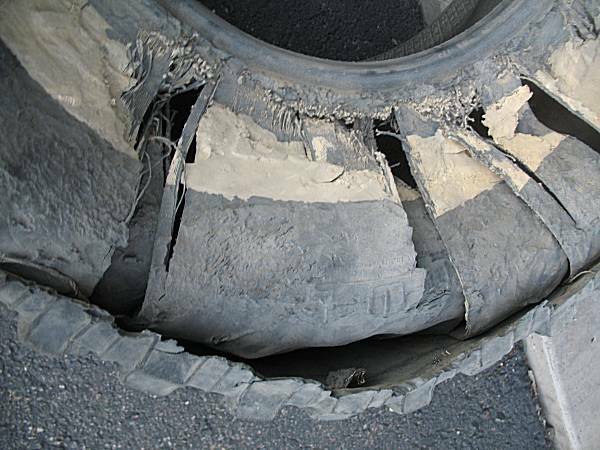 Until now the tire had remained on the rim and the rim was not damaged. RATS! 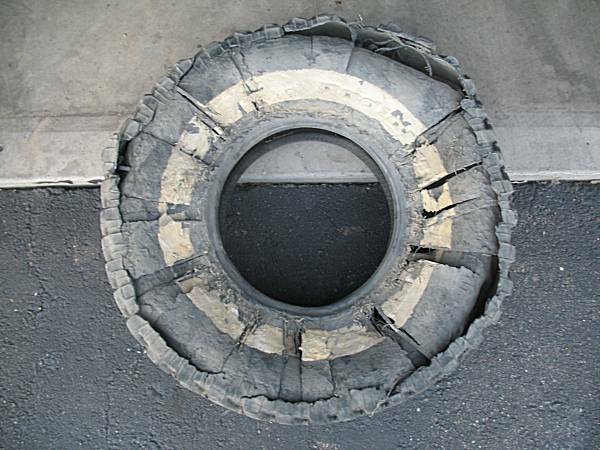 Tire - Gone! Top - Gone! Rim - Soon to be Gone! Are you a believer that things Come In Three's? I tried to re-rim the tire by rolling atop of it but after a scant minute the task seemed futile vs. just get the job done. 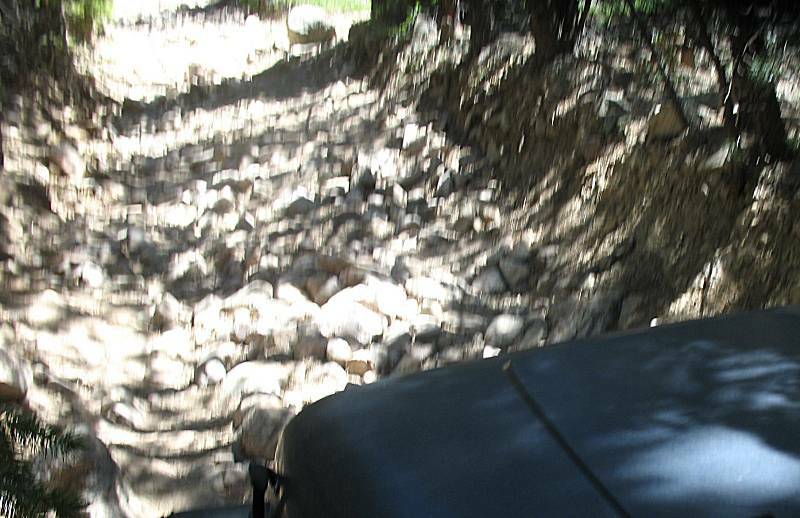 Tossing the shredded tire into the jeep, off we went - bumping over rocks as there was diminished ground clearance (fortunately, the remaining trail wasn't too severe). 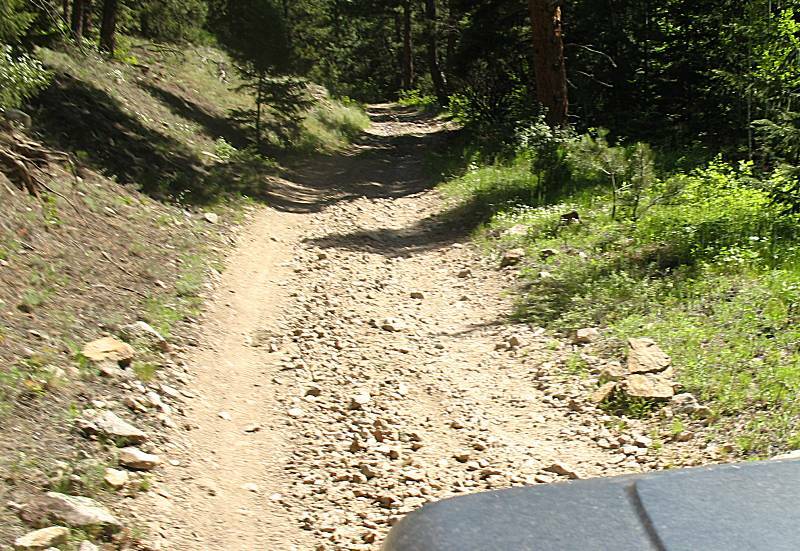 Back to the trailhead, the plan was put in motion - move trail supplies into Tom's jeep, he'd drive me to a local hardware store, I'd buy an angle grinder to grind flats onto the security lug nut to remove it - done deal. The rest of the afternoon went according to plan. Lug nut off, tire changed, I was on my way and such was Tom. Tom: Thank you for the assistance. I'm sorry the day went longer than planned. 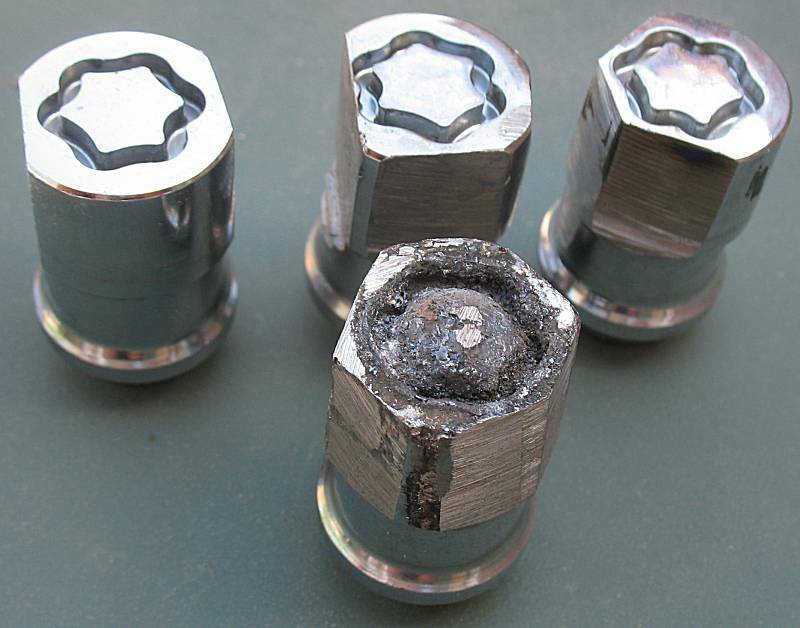 With the jeep back at home and an angle grinder in hand, the remaining three lug nuts were ground down and removed. 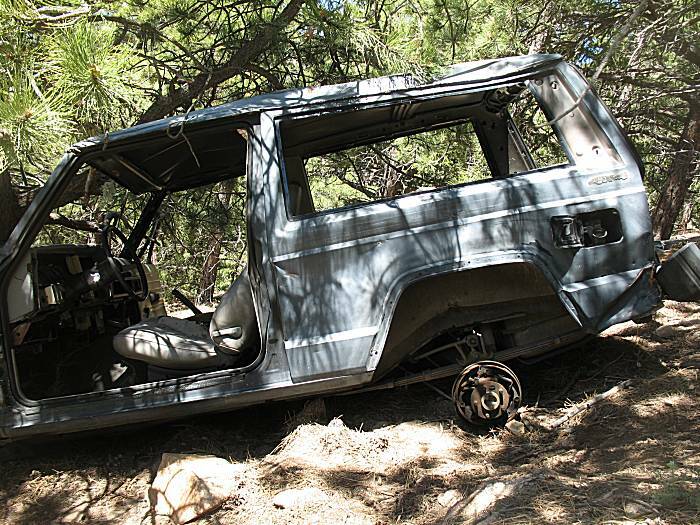 They should be not needed (famous last words) as the jeep should likely never be left alone in the woods. The order form for a replacement key went into the shredder. 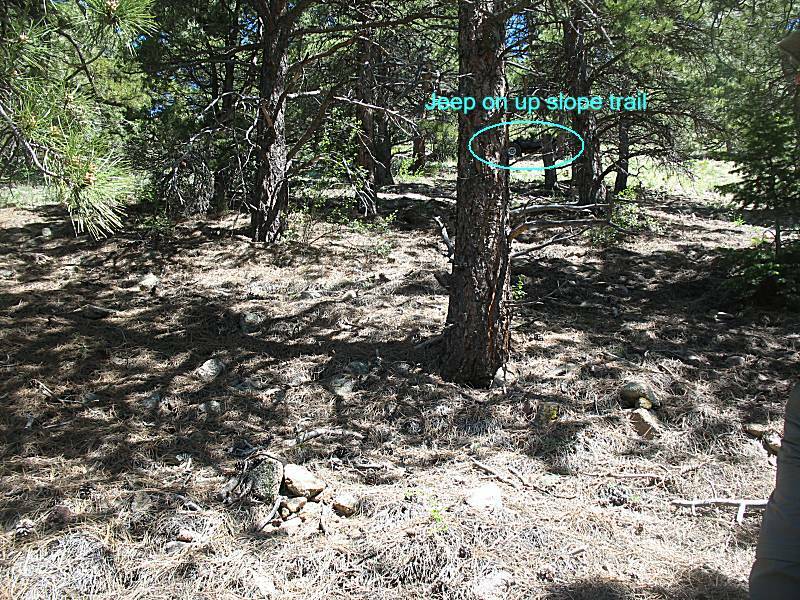 The dots show the trail that might be used to get the abandoned vehicle out of the forest. 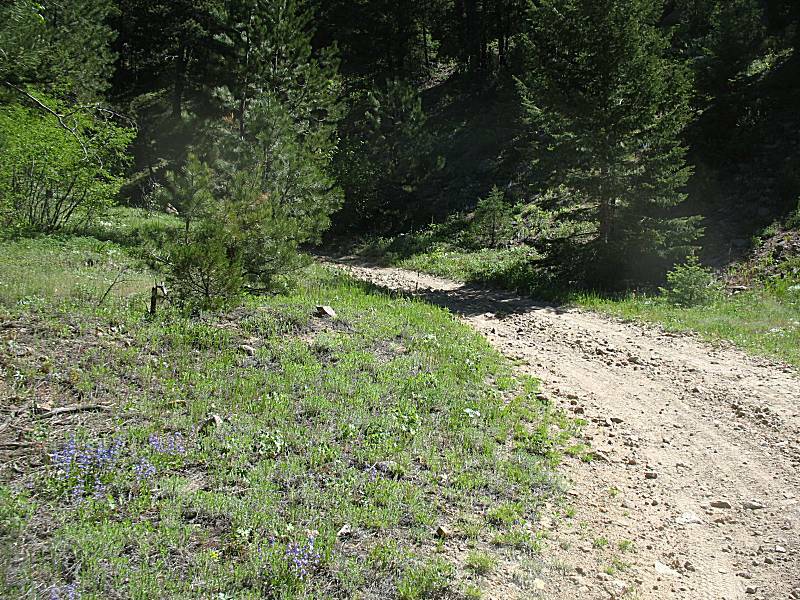 The trail is gated so talks with the landowner will be needed. 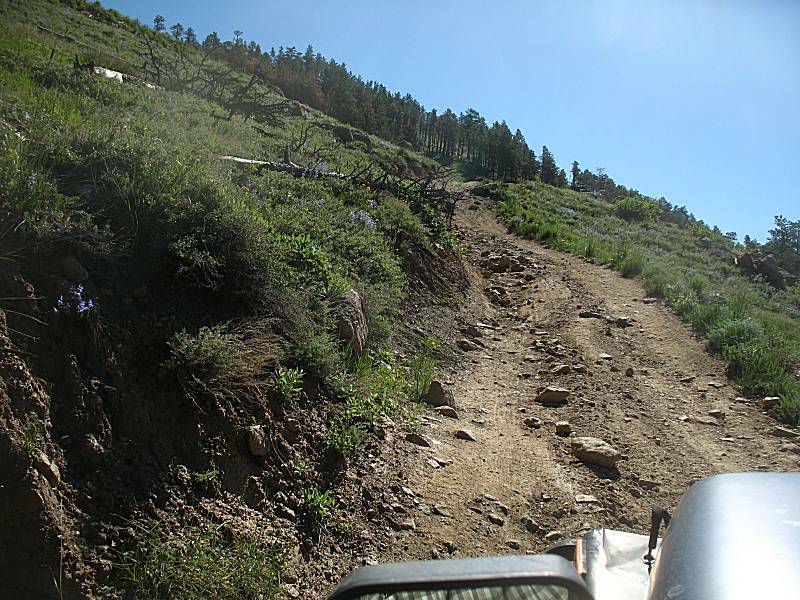 Without this way out, the vehicle might remain for a while as "the other way out" has a long, rocky, uphill that the vehicle would need to be pulled up. The route would be perhaps twice as long. Jump from fireman hill to the "end of the trail". 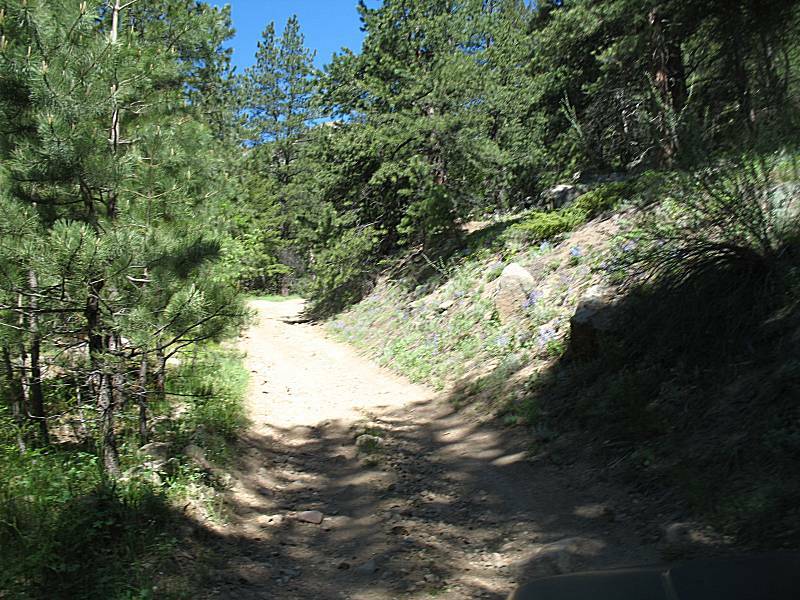 We're now heading back from the dead end trail towards the vehicle. 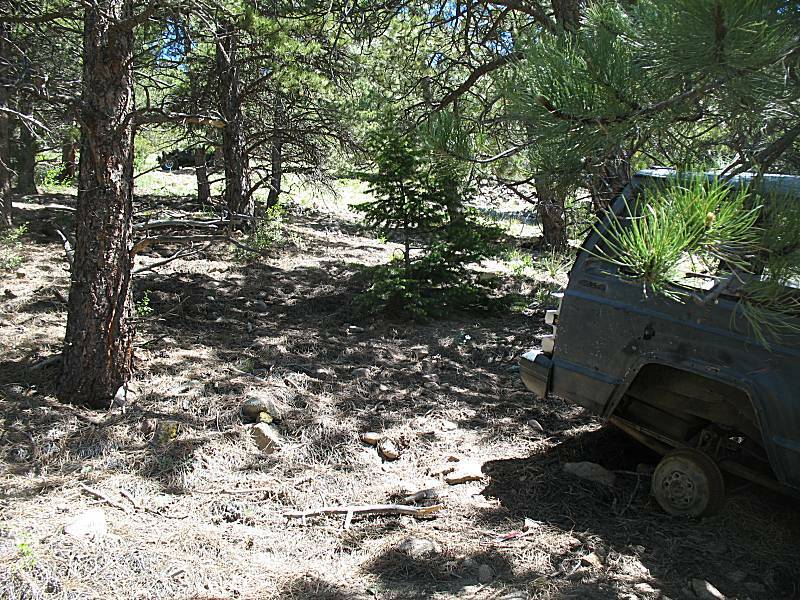 These are merely photos of the trail quality to remind what might be dealt with for pulling the vehicle out. 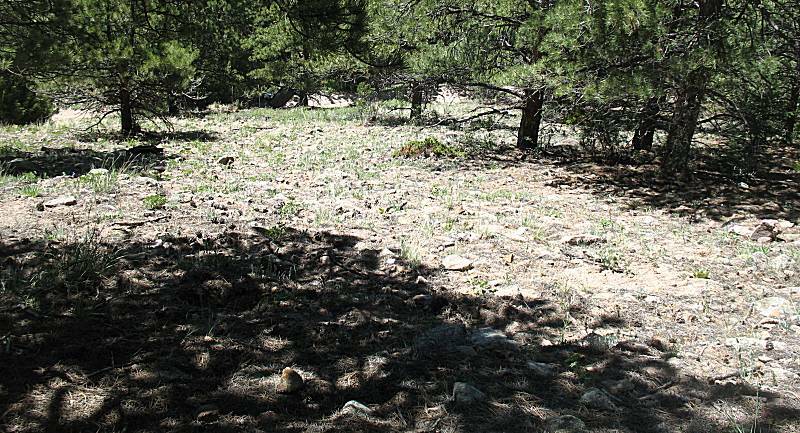 There is a 500' section with larger rocks - so far the most difficult section (for what was viewed - there is a section of trail yet to be traveled). This is the worst of this section. The vehicle is only about 500 feet farther up trail. Open area to lower the vehicle. 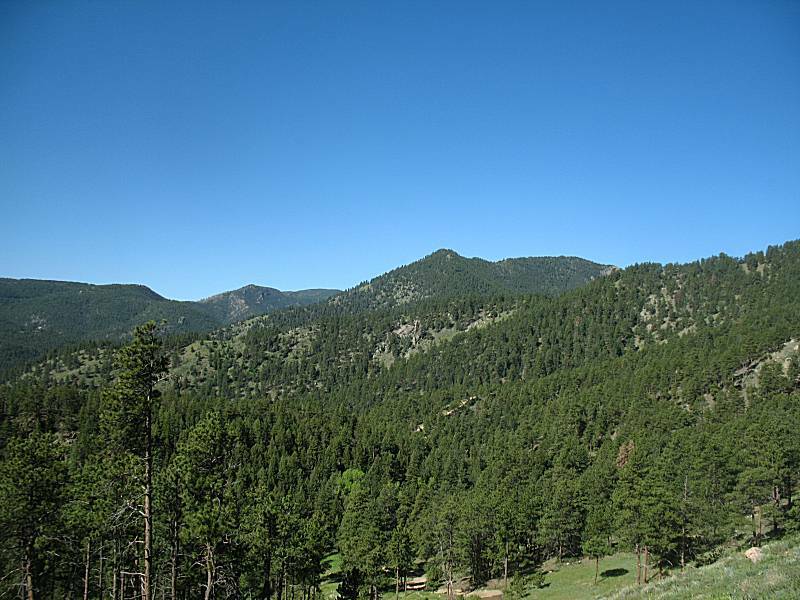 This is the "higher" trail. It is a short spur to a dead end. I have not been there so it would be nice to see the end. I considered backing down, but didn't (and should have). It goes to a long un-used mine. 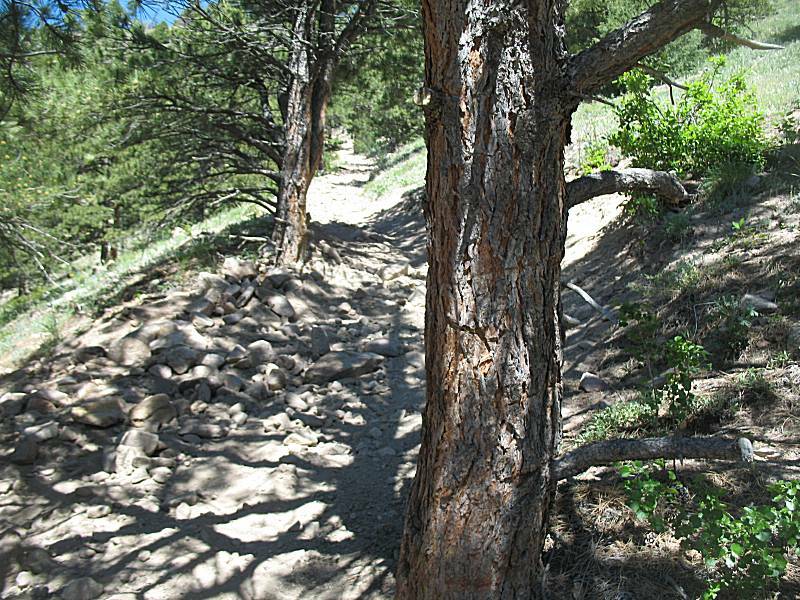 This is a narrow section of trail. My right front bumpted up against the tree. I moved left "just a bit" to make it by. Of most importance is that next to the base of this tree is a 4" diameter stump extending a foot above the ground. In another seven feet it will slice through the sidewall of the right rear tire. Back at the trailhead, angle grinding is complete with "hex" flats onto the security key. The lug wrench has loosened the key. 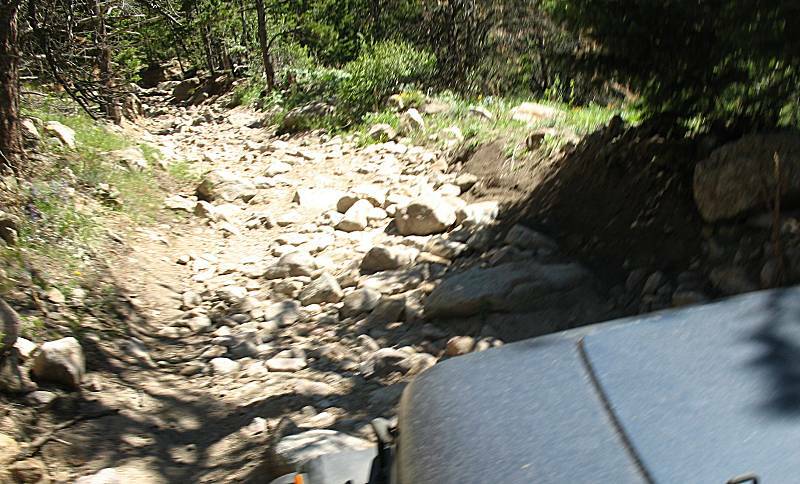 Now to jack the jeep up and change the tire and get home. The 110v AC inverter, with electric chain saw, rides along on springtime trail visits for larger tree removal tasks. It was a useful tool to have at hand. About 2 miles of trail riding on the tire (at about 2mph). A bright spot - of the five tires, this was the worst one. Now to see if the wheel can be reclaimed for use as a spare. The remains of the lug nuts - flats only ground into the top three were done at home while the bottom, with arc-pitted surfaces, was the big issue on the trail.